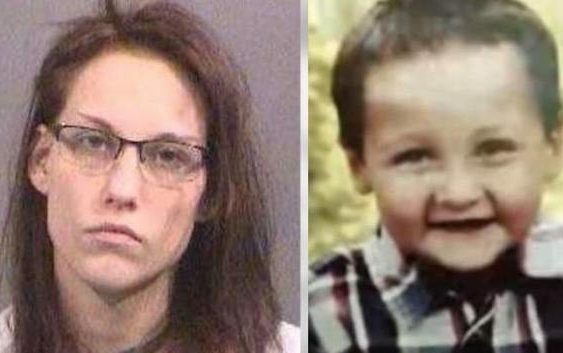 WICHITA, Kan. — Authorities are investigating the reported suicide of a Kansas woman who led a private investigator to the decomposing remains of her 5-year-old stepson, three months after reporting him missing. Police said officers responded early Friday after Jonathan Hernandez called to report finding a woman dead of a gunshot wound in his Wichita home. Wichita police said Hernandez reported that Emily Glass has killed herself. A rifle was found at her feet, along with three suicide notes in the home, police said Friday. Glass, 27, reported Hernandez’ son, Lucas, missing on Feb. 17. She told police she last saw Lucas playing in his bedroom before she took a shower and fell asleep. On May 24, Glass led David Marshburn, a private investigator hired by Lucas’ father, to the boy’s decaying remains. The boy’s body had been hidden under a culvert bridge about 20 miles north of Wichita and covered with debris. Police arrested Glass on suspicion of lying to authorities, but she was freed. Prosecutors haven’t charged her in Lucas’ death but said she was a person of interest. It’s unclear if an autopsy and toxicology examination will determine how Lucas died, because of the body’s decayed condition. Speaking Friday, Wichita police called the case a homicide investigation and said it was ongoing. Glass has been questioned in the boy’s disappearance and death, police said. In an episode of the podcast “Crime Stories with Nancy Grace” that aired Monday, Hernandez said he no longer believes or supports Glass and that he is “a bit confused by” her release from jail. Hernandez was not at home when Lucas disappeared. Glass cared for her daughter and Lucas while Hernandez worked out of state for weeks at a time. Lucas’ biological mother didn’t live in the Wichita area when he disappeared. Glass was earlier acquitted of child endangerment in an unrelated case involving her own daughter. Prosecutors allege Glass smoked marijuana then drove her 1-year-old daughter to a restaurant. This occurred one day before Lucas was reported missing.